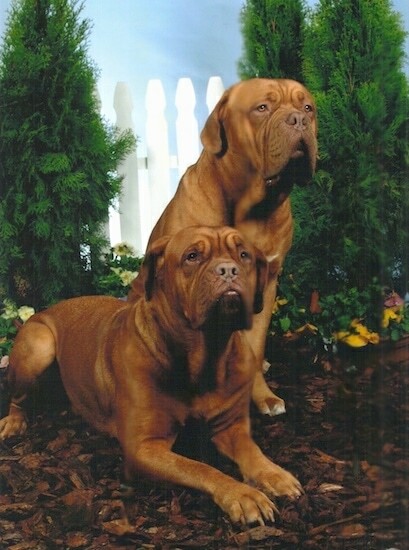 Dogues de Bordeaux—female: Red Autumn Roxy (Roxy), 2½yrs, 119 lb., "family instigator" male: Tonka Toy Rhys (Reese), 2 yrs, 128 lb., "gullible and protective to his family"
The Dogue de Bordeaux, also called the French Mastiff and sometimes called the Bordeaux Bulldog, is a relatively short, stocky mastiff. The wrinkled head is massive, heavy and broad. Males can have a head circumference of 27-30 inches (68-75cm). The muzzle is somewhat short (1/3 the total length of the head), wide, powerful and thick, with a pronounced stop. The nose is large with wide-open nostrils; color depends on the mask of the dog. The teeth meet in an under-bite. The upper lips hang thickly down over the lower jaw. The thick skin on the neck is loose, forming a noticeable dewlap. The eyes are hazel to dark brown, depending on the color of the dog, and are set wide apart. The ears are small, hanging down, in proportion to the dog and are darker in color. The tail is thick at the base, tapering to a point. The chest is deep, broad, reaching lower than the elbows. The legs are muscular. The coat is short and soft with loose fitting skin. Coat colors include various shades of fawn to mahogany with a darker red or black mask around and under the nose including the lips and eye rims. There are sometimes white markings on the chest and tips of the toes. The Bordeaux has a good and calm temperament. It is extremely loyal, patient and devoted to his family. Fearless and confrontational with strangers, he is a first class watch and guard dog. Socialize very well with other animals, preferably starting from an early age to avoid him being aggressive with other dogs. The Dogue de Bordeaux snores and drools. 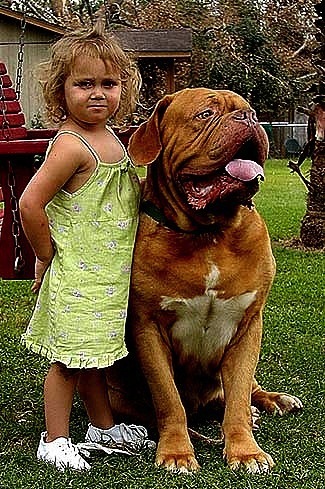 Despite his fearsome appearance, the Dogue de Bordeaux is gentle with children and family members. However, this is a powerful animal, and is not suitable for an inexperienced dog owner. The objective in training this dog is to achieve pack leader status. It is a natural instinct for a dog to have an order in its pack. When we humans live with dogs, we become their pack. The entire pack cooperates under a single leader. Lines are clearly defined and rules are set. You and all other humans MUST be higher up in the order than the dog. That is the only way your relationship can be a success. This breed needs a calm, but firm owner who displays a natural authority over the dog. One who is confident and consistent. Most are healthy, but the breed can be prone to hip dysplasia. There are also cases of epilepsy, heart problems and hyperkeratosis. Dams often have to have cesareans. This breed will do okay in an apartment if it is sufficiently exercised. They are very inactive indoors and will do okay without a yard. Needs lots of exercise. They need to be taken on a daily, long walk. Dogs that lack in mental and/or physical exercise can develop behavior issues. Very little is needed. This breed is an average shedder. 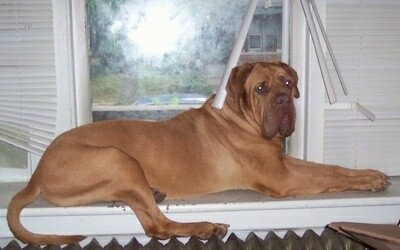 There are numerous theories about the origin of the Dogue de Bordeaux. It may be descended from the Bulldog, Tibetan Mastiff and from the Greek and Roman Molossus, from mastiffs brought to Europe by the Alans, from the dogs of Aquitaine or from Spanish dogs from Burgos. 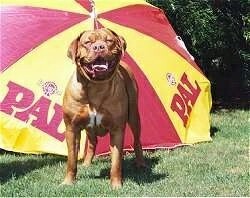 At the end of the Middle Ages, the Dogue was used as a cattle driver and personal bodyguard. Lots of Dogues died during the French Revolution. After the war number rose again. 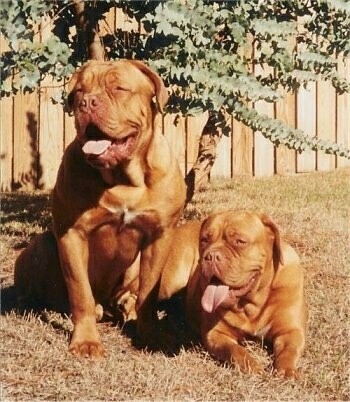 Raymond Triquet and his French Dogue de Bordeaux Club saved the breed. 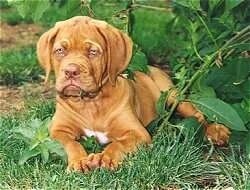 The Dogue de Bordeaux is now thoroughly established in France and gaining popularity in other countries. The breed has served as a war dog, flock guardian, cattle herder, guard dog, trained to bait bulls, bears, and jaguars, and as a hunter of boars. The breed was recognized by the AKC in 2008. 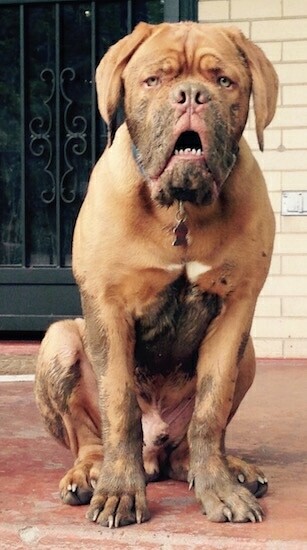 Otto the Dogue de Bordeaux at 6 months old after playing in the mud. 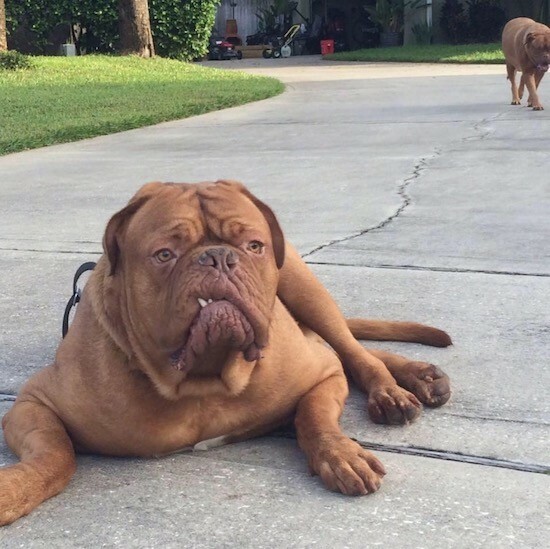 Razz the Dogue de Bordeaux at 3 years old with Mathilde—"I am a 170 lb French Mastiff and I love Mathilde. She likes to walk me,divalthough she could ride me if she wanted." 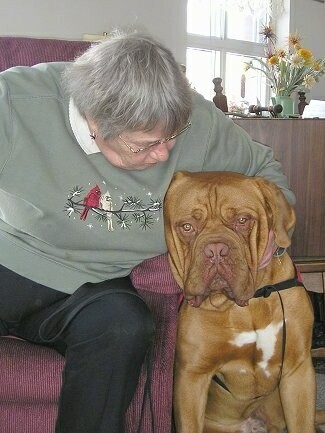 "This is Tars Tarkas, my 15-month-old male Dogue de Bordeaux on his volunteer therapy visit to our local senior’s home. Tarkas became a Certified Therapy Dog at age 1 year and 10 days. His so gentle and loving nature makes him a wonderful therapy dog." 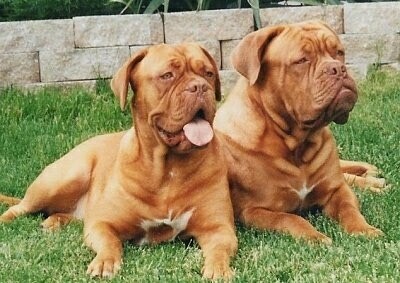 "This is a photo of my 2 male Dogue De Bordeaux's. They are both Certified Therapy Dogs with IWC Certification."